new to tt how do u get eggs or whatever u need to get a dragon? You can accumulate scales by doing offers and/or surveys and then purchase an egg (and a nest, which is required for your egg) in Cogg's Coop (under the REDEEM tab at the top of the main TreasureTrooper page). You can also receive a free egg (although you'll still have to buy the nest) by using Cash Search 100 times--only 3 searches a day count toward the free egg, though, so it'll take just a little over a month to get it--or through various special promotions that occur throughout the year. 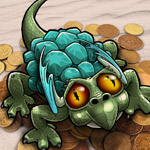 For example, there are sometimes special holiday dragon's eggs that you can get by completing the specified number of offers, surveys, and/or Cash Tasks. Please check out our awesome Dragon Guide to find out about everything you need to know about raising, breeding, fighting, and selling dragons. Good luck! You have to visit Cogg's Coop to get an egg. You can also get an egg by doing 100 cash searches.